Here we are going to see, some example problems of finding curved surface area and total surface area of cylinder. 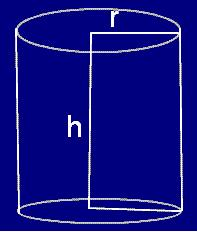 The radius and height of a cylinder are in the ratio 5:7 and its curved surface area is 5500 sq.cm. Find its radius and height. A solid iron cylinder has total surface area of 1848 sq.m. Its curved surface area is five – sixth of its total surface area. 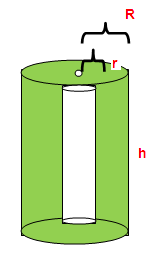 Find the radius and height of the iron cylinder. The external radius and the length of a hollow wooden log are 16 cm and 13 cm respectively. If its thickness is 4 cm then find its T.S.A. After having gone through the stuff given above, we hope that the students would have understood, "Curved Surface Area and Total Surface Area of Cylinder Examples". Apart from the stuff given in this section "Curved Surface Area and Total Surface Area of Cylinder Examples" if you need any other stuff in math, please use our google custom search here.